The question I had, as I picked up the 2016 Cadillac CTS V-Sport on a summer Saturday morning, was how a four-year-old might like it. My younger son, Dominic, was four at the time, counting down to his fifth birthday, and it was mostly for his sake that I had arranged to pick up a review car—a high-powered American luxury car—to drive on our weeklong vacation trip. I had already known the CTS V-Sport wasn’t going to be my kind of car. The cars I have always felt comfortable with are lightweight, imported, economical. My parents were not rich, and more than that, they were not spenders, and so the cars of my early childhood were a 1967 Volkswagen Beetle, in zenith blue, and a 1975 Volkswagen Rabbit, in school-bus chrome yellow. When the Beetle got totaled in a crash and when the Rabbit broke in half on a repair-shop lift from body rust, my parents replaced them with a used yellow 1974 Beetle and a new dark-red 1986 diesel Jetta, respectively. My exposure to the big American car came mainly through my friends’ cars in high school, gas-swilling, prematurely crumbling hand-me-downs from the darkest, most bloated and dysfunctional days of Detroit. There was a ’79 Dodge Diplomat with a cloth roof liner that drooped onto your head; there was a Charger with a speedometer that spun to random numbers. And there was one immense silver 1976 Cadillac Eldorado, a seedy living room on wheels, with bench seats holding three people fore and aft and with power windows that went down at the flick of a switch and sometimes, less often, would even come back up again. The whole traditional American luxury ideal—floating apart from traffic, on a soft suspension with distant corners—made no sense to me. I expected a car to put a minimum of separation between the driver and the surrounding world. When I started driving, it was in the ’74 Beetle. I would push-start it when the starter intermittently failed, and to supplement the AM radio on long drives, I’d prop a boombox on the passenger seat, against the door, steering with one hand while reaching across to change cassettes by touch. After the Beetle came a used ’84 Civic—peppy enough to hit 100 mph, once or twice, when asked on an empty highway, but more satisfyingly able to cover 385 miles, from home to where my future wife lived, on a single 10-gallon tank of gas. When we married, we bought a new 2000 Golf and took good care of it. Six or seven years later, while we were living overseas, I sold that Golf to a friend who needed a car. Now we live in Manhattan, where the younger boy’s defining experience of cars is of not having any car at all. When Dominic was born, he came home from the hospital in a car safety seat snapped into a car-seat stroller for the six-block walk. Every couple of months, when we need to go somewhere farther away than Brooklyn or Newark, we use a car-sharing company. Mostly these cars fit my existing preferences—a lot of Mazda3s, some Honda Civics, a decent Jetta that lives in the garage right across the avenue. Sometimes we get a Nissan that’s boring even by my standards. Despite this, Dominic loves cars. Before he could really walk, he was crawling into the closet to loot the toy cars and trucks that his older brother had been only mildly interested in. He calls out carmaker logos when he sees them on the street; he badgers me to tell him the difference between a crossover and an SUV. For some reason, he has decided to be crazy about Chevrolets. At first, Jalopnik decided the very best, or the most entertainingly unsuitable, car for us to take on the road would be a Camaro SS. This seemed exactly right—a dream come true, from the four-year-old’s point of view—till I looked up the specs and discovered the trunk could basically hold one suitcase, for the week-long trip. This was the difference between being four going on five and being 44 going on 45. So we found a different way to try to make me uncomfortable: by making me very, very comfortable. A Cadillac might not be as special as a Camaro, by my young passenger’s standards, but it promised to be extremely alien to me in the driver’s seat. I packed our bags—the two boys and I would be making the trip, while my wife stayed home and got some work done—and took a taxi downtown to the garage. 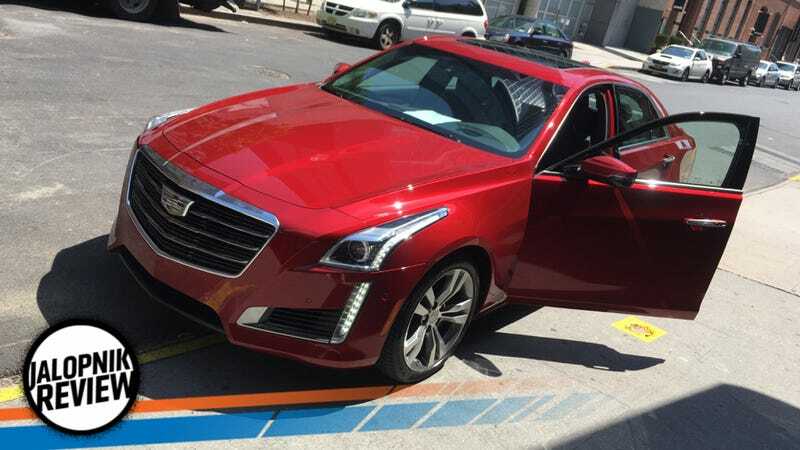 The CTS V-Sport was waiting there, deep red and bulky. I couldn’t decide how I felt about how it looked; it was like trying to decide if a tiger had a trustworthy face. In a whole week with the car, I could never hold a reliable mental image when I wasn’t pointing my eyes at it. But as I got into it, the sense the unknowable gave way at once to a disappointing familiarity. I was settling into a car—not a first-class train compartment, not an expensive hotel lobby, but a driver’s seat like any other driver’s seat in this post-bench-seat era. It was leather. Maybe it was a little more cockpitty. Maybe I was a bit more ensconced than usual. But it felt like a regular car. The steering wheel, I did notice, was a very nice soft suede. Before I could use the steering wheel, though, I had to adjust the seat. I stuck my hand down where the seat controls would be. There were a lot of possibilities down there. I pressed something or other and the leather jabbed me in my lower back. I tried to reverse the jabbing and I couldn’t quite make it happen. I resolved to fix the seat configuration later. There were too many other things to sort out. The CTS V-Sport controls appeared to have been designed under two separate imperatives: In the name of simplicity, there was an all-purpose touchscreen in the middle of the console, but in the name of thoroughness, there were buttons and switches all around it. I scribbled some notes about it all in my pocket notebook, then put my pencil into one of the cupholders. It clinked. The bottom of the cupholder was metal. I searched a long while for the parking brake before I figured out that it was a rocker switch on the dash. I rocked the switch back and forth till I was sure the brake was off, put the automatic transmission in drive, and carefully pulled out. As I worked my way around to get pointed uptown, I passed a car wash. A brilliant blue Camaro SS was emerging from it. Alternative possibilities are everywhere around us. At stoplights, I paged through the CTS V-Sport owner’s manual—that is, one of the manuals, the 20-page short-form version—to see what the car was supposed to do besides driving. The manual said that there was a powered automatic cover that would slide over the cupholders when they weren’t in use. It also said there was a sunroof. I hadn’t even thought to look up till then; I’d never had a sunroof. There were front and rear sunshades. There was a heads-up display. I wondered what might be left to cover in the full-length manual. Meanwhile, I was driving. The car felt distinctly unhappy on its way up Tenth Avenue, growling along resentfully at city-driving speeds. Then I came up to a light that was turning yellow, and I gave the gas a little stomp, and the car shook off its sullenness and jumped to the far side of the intersection before the light could get anywhere near turning red. We could communicate, after all, this Cadillac and I. The side windows, I learned, would flash a warning when something was in my blind spot. The driver’s seat would—alert me? If I were in danger of hitting something? If I asked it to, if I had read the manual correctly, it would parallel-park itself. As I went around a corner, the notebook slid off where it was balanced on my leg and landed where the seat met the center console. In an economy car, it would have been down in the darkness of the seat crack, with me probing a flattened hand down there to try to rake it up, probably picking up grease from the seat slider. Here there was no gap, just a securely flush junction. I made a right into the apartment building’s driveway, under a scaffold. The right side of the seat buzzed furiously underneath me. The CTS V-Sport had evidently sensed the scaffolding and was uncomfortable with it. As I pulled into the cutaway past the apartment’s front doors, where vehicles stop for loading and unloading, the uncertainty was replaced by a high-grade certainty: An array of cameras and sensors delivered to the dashboard screen a full overhead image of the car and its surroundings, showing me exactly where it sat in relation to the curb. I could pull in without wasting any space. In no time at all, the luggage was in the trunk, the booster seats were in the rear, the navigation system was engaged, and we were on the road. My lifelong mental image of a family car trip is derived, as best I can guess, from some combination of Henry Reed’s Journey and Family Circus cartoons. It involves a well-packed station wagon and open spaces somewhere out West. Our family had never done anything of the sort. I can only remember taking two vacations for vacations’ sake, most vividly a trip to Mount Desert Island, for which we’d ridden all the way from Maryland to Maine not in the Rabbit or Beetle but in my grandmother’s then-newish Toyota Tercel—three adults, two teen or near-teen boys, and an aged miniature schnauzer, all in what was in retrospect an incredibly tiny economy car. I don’t recall even feeling crowded; what mattered was that, unlike the regular family cars, the Tercel had an air conditioner. Now my two boys rode in their two booster seats on the wide back seat of the Cadillac. Dominic had decided it was acceptable, despite not being a Chevy; his older brother, Mack, had complained as usual about the new-car smell. The climate control had separate thermostatically controlled zones, adjusted by dragging a finger over the buttonless surface of the console, following little chrome guide bars. The same technique controlled the stereo. I had bought an expensive iPhone not long before, with a memory big enough to take over for my faltering, decade-old iPod, and now it was shuffling through my music collection on the Cadillac’s speakers. Before we really got going, we detoured to the Ikea in Elizabeth, New Jersey, to get a wok to cook with at the beach, and to grab lunch in the cafeteria there, watching planes land at Newark Airport while we ate meatballs. I have driven to the Ikea many times, in many cars, but this time the road from the turnpike to the shopping plaza seemed suddenly unfamiliar, as if the landmarks were gone, or as if they weren’t registering. As I hunted for the turns I should have known by heart, I realized what was going on. Between the floating heads-up numbers for speed limit and speedometer, and the mid-dash navigation map, and the amber blind-spot warnings superimposed on the side mirrors, the information pouring out of the car had overtaken of my usual moment-by-moment noticing. Rather than floating the body above the roadway on a plush suspension, the Cadillac was floating my mind along on a stream of supplemental and substitute data. I’d achieved the luxury of not thinking. I was, however, very self-conscious. Back out on the highway, putting the miles behind us, it was easy enough to push the car along at 65 or 75 miles per hour. Sometimes, though, another powerful or expensive car would come up and pass us and I would feel as if I had let them down, as if the rest of the traffic expected more from the burly red Cadillac. Now or then I would give in to this imagined pressure and hit the gas a little harder. It was in these moments that I discovered what the CTS V-Sport was really good at—it was made to get from the low or mid 70s to the mid or upper 80s. All I had to do was give the gas a little more weight, and the car would surge immediately, so that by the time I focused on the number glowing on the windshield glass it was already 88, 89. This was impressive and it was quite unlike my usual experience. It was also an incredibly dumb thing for a car to be good at. Why should the jump from normal highway speeding to flagrant speeding be made so easy—easier than, say, the jump from 50 to 65? A Honda Civic or a VW Golf will go up past 85 if you ask it to, but you have to ask it deliberately. You have to lean on the gas and keep leaning. This seems like a much more sensible way for a car to be. New Jersey flowed into Maryland into Delaware. A brief shower came rattling down at some point, and the wipers whisked it away with authoritative force. At some point, Dominic fell asleep. After we were done with the Cadillac, I asked him if it had been comfortable to sleep in. “It was like all the other cars,” he said. Looking at the dash for more things to do, I tried activating the cooling system built into the driver’s seat. Do you enjoy sitting on something cold? I did not. I turned it off. There wasn’t much driving to do, once the car was at the beach. The rental unit was one row back from the beachfront houses, and one lot over from the entrance to the boardwalk, so the car would mostly sit. Out past the boardwalk, the last big winter storm had chewed away huge chunks of the dunes. Where a gently sloping ramp had once led down to the beach, newly installed stairways now handled the steeper drop. Rising seas were not an abstraction. Dominic would go out and look at the parked Cadillac sometimes. I had to discourage him from trying to climb up on the hood. He had gotten the hang of raising and lowering the rear side-window sunshades. One day I needed sunscreen, so I drove with Dominic to the drugstore, about a mile. For an alarming moment I thought windblown sand had gathered in the window gasket, but it was soft yellow plant matter. The seat-buzzer warning system was not as good at warning about bicyclists as it was at warning about scaffolding, so I had to use my eyes and neck while backing up. We went carefully, the Cadillac once again sulking at the low-speed work. We opened the sunroof and the fresh air was almost as nice as it was on the 25-cent beach trolley. Another morning we needed groceries. The shortness of the drives didn’t matter to my passenger, as long as the sunroof was there to be opened. When we came out of the supermarket, a little red foreign roadster was parked beside the big red Cadillac, like a toy removed from inside a larger toy. The roadster seemed, in the moment, a more alien kind of car than the one that I had, after all, already gotten used to running errands in. From his seat, Dominic asked me what some buttons in the back were for. I had no idea what he meant till I reached back and felt an entire little back-seat climate-control console I’d overlooked. He couldn’t really reach it, from his booster seat, and I couldn’t tell what any of the controls were, but it was there. Loading the luggage back into the Cadillac’s trunk—the ample and sufficient trunk—on the final morning of vacation, I had a sudden feeling that was both proprietary and dissociative. I saw myself: a middle-aged man in chino shorts and an untucked sport shirt, standing in a driveway, packing the family possessions into a large American car. True, I didn’t own the CTS V-Sport, and couldn’t really afford to. But in that moment, all squared away and ready to drive, it seemed as if I could have. Traffic was heavy on the local highway up out of the beach towns. In one particularly dense stretch, the car in front of us stopped abruptly, so much so that for the first time all week I had to jam on the brake. The heads-up display flashed me a stylized orange image of a collision; one of the boys’ water bottles thudded to the floor. Dominic, already asleep, was roused to complain about the rough stop. According to one of the information displays on the dash, the car would hit the limit of gas tank’s cruising range after about 350 miles, which would be somewhere in New Jersey. It occurred to me that I had no idea how I would open the gas cap when the time came. I could see the paddle shifters, the automatic-parking controls, the sunshade switches—where was the gas release? I paged through the entire condensed manual, all 20 pages of it, and saw no mention. Finally I opened the glove compartment, using the glove-compartment-opening button on the center console, and fished out the full manual, the 400-pager. On page 252 I found my answer: There was no gas release button. The tank would unlock itself when the doors were unlocked. Simplicity. Mile by mile, the sense of being in a borrowed car on borrowed time grew. The remaining driving range dropped and dropped. We weren’t getting terrible mileage, by the historical standards of luxury automobiles, but the Cadillac was not made for pushing it. Right around the Delaware Memorial Bridge, seven or eight miles shy of the John Fenwick Service Area, the range display switched to reading “—”—the soothing infusion of information cut off cold turkey, sending prickly nerve signals crawling over the hands as they gripped the soft wheel. It was like being back on the Mass Pike in the old Civic, eyeing the needle on its way toward E.
We made the rest stop, put a lot of gasoline in the tank, and went on. The Lincoln Tunnel was jammed up, as usual. No amount of leather or technology could make a difference. The last bit of hypothetical desire to hang onto the car drained away. A car in New York City is nothing but a burden to lug around, and a big car is just a big burden. Dominic accepted the ride’s end with equanimity. “The thing I like about it is it’s fancy and it’s a wide, very wide car,” he would recall, much later. On the trip downtown to return the car, in the West 40s, I saw a determined pedestrian who kept passing me, slow block after slow block. The light would change, the Cadillac would move ahead, and then the foot traffic would overtake it again. The construction zone around new luxury development squeezed in on the roadway, and the bird’s-eye virtual camera, reading it as a hazard, turned itself on to try to guide me through it. With the car shut off, there were ghostly fingerprints and smudges marking the places where the touchscreen controls had been used most often. Inside the console, Cadillac had included a soft cloth, for buffing them away. Correction: This post originally identified my family’s second Volkswagen Beetle as a 1973 model. My older brother, who had a childhood obsession with the minor year-to-year variations in Beetle design, has convinced me on the basis of the plastic end caps on the bumpers that it was in fact it was a 1974. That was also the year Volkswagen debuted an ignition interlock in Beetles, which may in retrospect have had something to do with that unpredictable and intermittent refusal of the starter to turn over, which gave me a lot of practice push-starting the car. Jalopnik regrets the error.